Lee Zeldin says as long as PA wants to 'wipe Israel off map,' there can be no peace; Obama's policy aids threats to Israel. 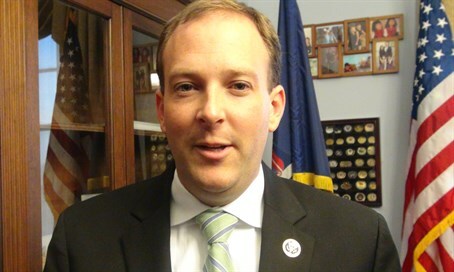 Republican Congressman Lee Zeldin of New York's first district told Arutz Sheva that the Palestinian Authority (PA) leadership seeks to destroy Israel, and as long as that is the case there is no "peace partner." "It is unfortunate that the Palestinian Authority is still influenced by an element that will not rest until Israel is wiped off the map," said the congressman, stressing that the "two state solution" seeking to divide Israel is certainly not viable as long as that reality continues. The PA is allowing itself to be controlled by an element seeking Israel's destruction, said Zeldin, and there is "no room for any tolerance; I don't see the right type of discipline and message from leadership." The congressman slammed the PA for seeking to "use media propaganda... to change facts and legitimacy," and slammed PA Chairman Mahmoud Abbas for going to the UN to preach "hatred and intolerance." When asked if US President Barack Obama is doing enough to defend Israel, Zeldin noted that Israel has never asked the US to send soldiers to fight its wars, but rather defends itself. He condemned the "disproportionate amount of capitulation" in Obama's foreign policy towards Iran, which will benefit from $150 billion in sanctions relief in the nuclear deal, and appraised that the "threats to Israel are benefiting from the current foreign policy."